According to the document, coal is 8,000 calories, and charcoal is 6,600 calories. Than manganese, the burning time is much longer than the fuel products. Low smoke and flame characteristics. From the early years of exploring the foot of the people outside the open land, many traditional handicraft also came out and developed strongly on the land of Ca Mau. Over hundreds of years of ups and downs, some Ca Mau villages have been preserved to this day and coal mining is one of them. 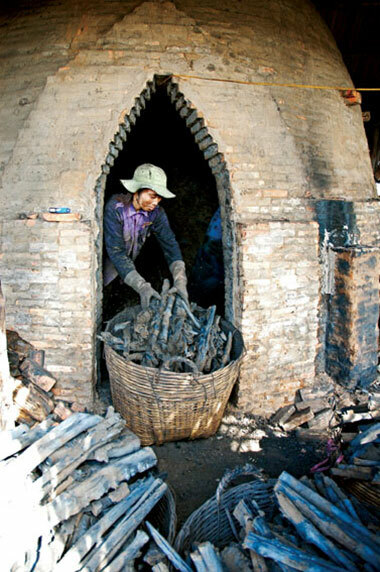 Coming to Ca Mau, it is easy to see charcoal is sold everywhere, and used for many purposes. Coal mining is a traditional occupation in many parts of Vietnam. Coal mines in Quang Ninh, Son La and Hoa Binh are often referred to, but coal mining in Ca Mau is associated with the excitement of an area. River. As far as going to the North of Vietnam, people are impressed by the way the mountain pass around the cliffs, as far as going south, the more unforgettable and unforgettable by the down, speedboat surfing, Moderated by the people here. For a long time, exploiting the standard mangroves to transport to the coal cooperative, the process for coal tunnel is a process that takes a lot of work. It is attached to this land as part of life here. Early in the morning, mangrove explorers have to prepare for the forest to seek raw materials. With the specificity of the water up and down the tide, in one day, the ferry transported only to a fixed time frame. In this land people say water is very important, the water is all work, static water is not doing anything. Workers have to look for mangroves that are suitable for their age and size, and at the same time absorb mangroves, roots, and fall. This work takes up a lot of time by the mangrove forests, each time they go fishing, people are able to exploit manually, transported to the bunker about 20km away, both travel and often take a day, Sometimes they do not have time to leave, they have to stay till the next day. 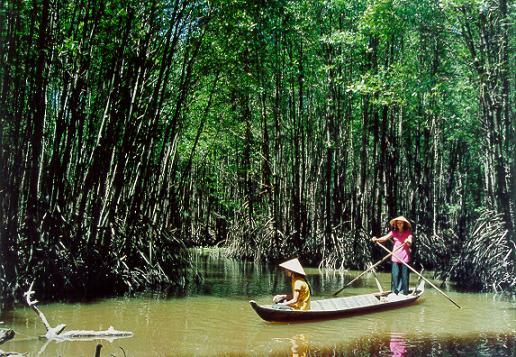 Previously, mangrove forests in Ca Mau were very large, the workers only need to enter the forest, select mangrove trees to cut down, as raw materials, from which to exploit unreasonable, the area of mangrove forests increasingly Narrowing. In 2006, Ca Mau province allowed the establishment of coal-fired co-operative to protect the forest, limiting illegal logging and coal mines. In addition, with the policy of selling the forest, people have combined with exploiting new mangrove forests. Mangrove forests cover the salt water, which is home to many kinds of creatures, so under the canopy of the forest, people are easy to catch people scouring crabs, catching snails. Having lived with this profession for a long time, catching crabs in the cave was not difficult for this young man. The mangroves, after being brought back, are cut into pieces to be placed in coal furnaces, this stage is called into the coal. The charcoal briquettes have a special feature, the furnace is made of card bricks and the binder is mixed from muddy sand and muddy sand, which, according to experience, does not lose the cement, is very durable but cheap, This contributes to reducing the investment cost of the furnace. Oval shaped like a cone-shaped down, about 3m high, about 4-5m in diameter, a door to stove wood and charcoal, in the coal pit, the door is blocked, except for small to fire and 3 tubes to smoke out. The skilled craftsman with the hands of flowers and sight, the sense of smell is very sharp, just smell the smell, look at the smoke to reduce or increase fire, or know the charcoal in the oven is not finished or not. This is the experience of the workers here. This requires the placement of charcoal, the rhizomes are cut in equal proportions, arranged cleverly closed and fit into the oven. This is an important step to create a quality coal quality, if not careful, will spoil a batch of coal. Mangroves also have a different quality than other types of coal and charcoal. According to the document, coal is 8,000 calories, and charcoal is 6,600 calories. Than manganese, the burning time is much longer than the fuel products. Low smoke and flame characteristics. So how does the coal pit process work? And how long does it take to get a batch of charcoal? The heat starts from the mouth of the oven, spreading evenly over the dome, then extending down to the bottom. Here, over a month to a new batch of coal. The question here is how the coal pit here is different from other coal tunnel ways. In the north, people burned directly and dipped water, so coal was not in the south. In the coal mines, not only men but women also participate in these hard labor. After a month burned wood at coal furnace, quality coal was born, people call this process is coal. Coal workers, the workman began to classify coal, pieces of crushed coal, broken up separately, large pieces of coal are separate. The classification is so easy to calculate the cost and serve the shipment to consumers. Mangroves in these cooperatives are mainly supplied in Ca Mau by not much quantity. With the change of the market mechanism, the introduction of many industrial fuels, and the mangroves have a time to exploit and use is not reasonable so the charcoal tunnel meeting with many difficulties and obstacles. Hard work, income is not high, so the charcoal industry is also lost gradually. Both the pit of coal in the day of hard work, the sweat labor does not stop on the forehead, but the voices, laughter, jokes always ring in the pit, express the joy of life. The land of Ngoc Hien, Ca Mau, with the beauty of Southwest, in the middle of the river, peaceful life, calm, the beauty is rustic, as simple as the people here.